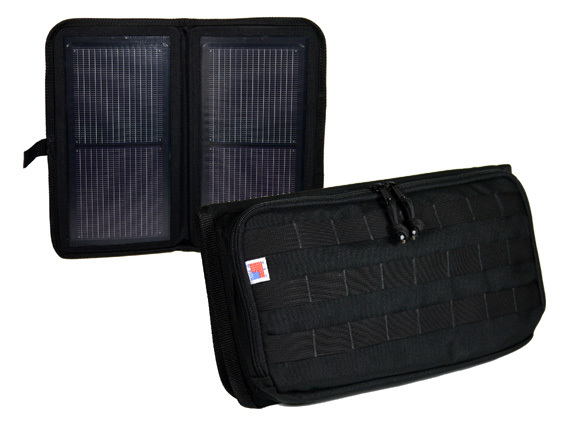 ROUND ROCK, Texas - Oct. 14, 2014 - PRLog -- Eclipse Solar Gear has introduced the Foldout Solar Chargers. The Foldout Solar Chargers are made at the Eclipse Solar Gear facility for a true Made in the USA product! The new Foldout Solar Chargers provide on-the-go charging for the Trackingpoint Precision Guided Firearm’s scope batteries, and the Remington 2020 rifle scope batteries while at the shooting range or out in the field. The chargers also charge most of the common mobile electronics and wearable technologies on the market today. The Trackingpoint technology is a significant advancement in modern firearms and requires a different level of portable power. Eclipse Solar Gear has been an innovation leader in portable solar power solutions, and the collaboration with Trackingpoint demonstrates how personal solar power can enhance the consumers experience and solve some unanticipated problems. It is another example of how a source of personal solar power can be applied to mobile technologies and wearable technologies. The Foldout Solar Charger features MOLLE compatible straps, a zippered main compartment with internal organizers straps for batteries, phones, and cable management. Folding up to a compact 14.5” x 8.5”, the Foldout Panels can be easily carried around in your backpack or other carry bag. The Foldout Chargers feature both 12V and USB outputs, and is available in 8, 12, and 16 Watt versions. Trackingpoint is a Pflugerville, TX applied technology company and creator of the world’s first Precision Guided Firearm (PFG) system. The PFG is the most accurate shooting system in the world. Called the Xact System, it solves multiple problems that long range shooters face. The Xact System ensures repeatable performance and accuracy even at extended ranges. The PFG also offers applications for smart devices. These apps interact with embedded wifi servers to share real-time or recorded images. Eclipse Solar Gear has been the recipient of multiple industry awards including a 2005, 2006 (Best of Innovations), and 2007 CES Innovations Design and Engineering Awards and a Laptop Magazine’s Editor’s Choice Award for the innovative solar backpacks and solar messenger bags. The backpacks and assorted carry cases feature integrated solar charging solutions designed to charge a wide range of mobile personal electronics and wearable technologies.